Chic glamour from American fashion label Michael Kors. An elegant brown dial with rose tone hands and hour markers beautifully complements its sparkling stone set bezel. A stylish ion plated bracelet offers a contemporary edge. Michael Kors Darci Ladies' Ion Plated Bracelet Watch is rated 5.0 out of 5 by 3. 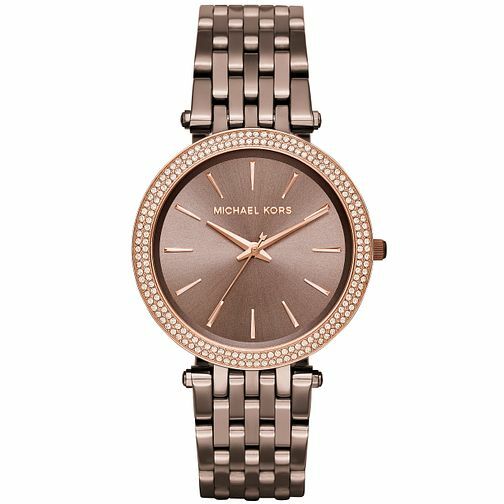 Rated 5 out of 5 by Anonymous from Lovely Watch I bought this Michael Kors watch for my daughter. It looks lovely and she seems very happy with it. I can's say much as she has only just had it and hasn't really worn it but this isn't her first MK watch so I expect it to be just as good as the other. Rated 5 out of 5 by Anonymous from Gorgeous colour Lovely watch. Lovely colour. Love Michael kors. Always do something a bit different.